Emerald Creek Dares: It's a Charmed Life! Mom...we love you for all you have done! Mom's everywhere continue to inspire and uplift us. Even if it's not your own mom, the ability to nurture has moved women to reach out and help others, and there's probably a Mom out there who has help to guide and mold a piece of you into who you are. Please take this Challenge to heart and create any project you can think of using Charms, Bling and other Embellishments. "You're beautiful - no matter what they say" - one of my favourite songs and message to all the ladies out there! Always remember that you are precious and doing a fantastic job at what you do and at how you do it! It's all about the ladies for this challenge. So I decided with Mother's Day right around the corner, that I would create a fun Mother's Day Easel Card. 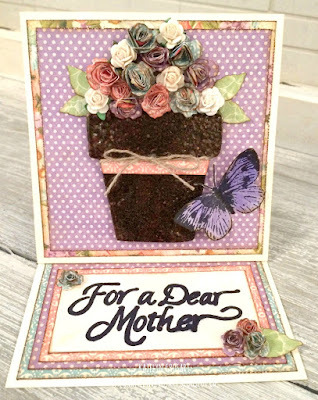 To all the Mother's out there, Happy early Mother's Day! Challenge is all about ladies... 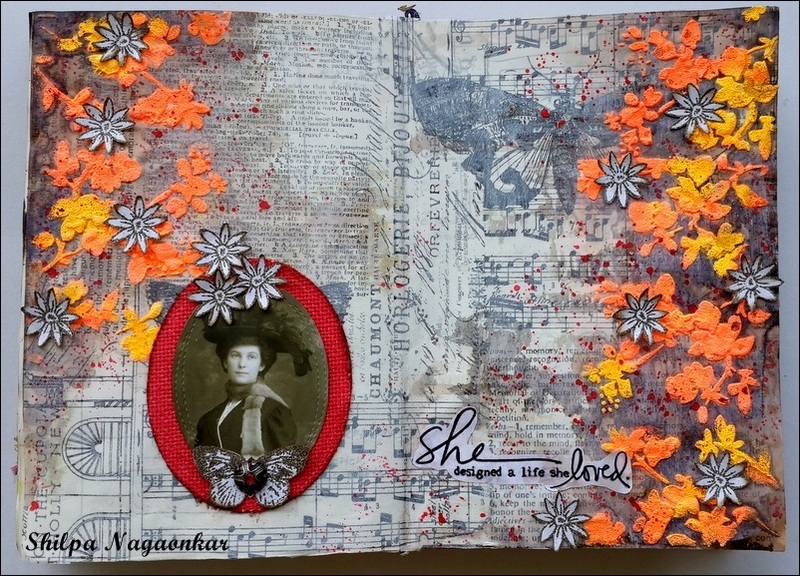 I created this journal spread keeping this brave lady in my mind, she designed her own life, she is a charming lady! 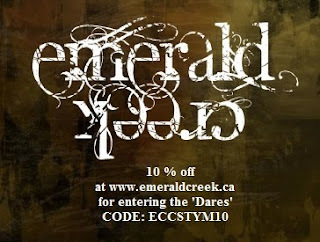 The time is flying by it seems and Mother's Day is just around the corner again and it's time for a new challenge at Emerald Creek Dares!! 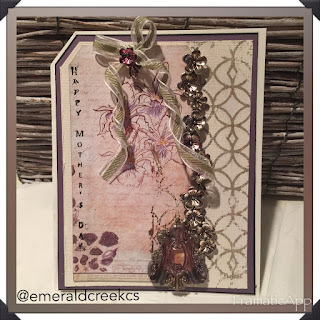 I love spending Thursdays sharing some amazing Emerald Creek products and incredible inspiration from the Design Team, with all of you who stop by. At the end of my post there is a more personal note about my Mom and missing her and a poem my son wrote for her service. Before you check out Julia, please note this is her last post with us. Julia will still be around lots but make sure you let her know how much you have enjoyed her creations. I flash back to that first day that Julia snapped a picture of her going through the demo stamps to prep for her frst ever DT submission. She continues to amaze me in all she does and we wish her well as her art and teaching continues to unfold. canvas designed around a couple of thrift store photo I had in my stash. This is dedicated to all the charming ladies of the Emerald Creek Design Team who I was fortunate enough to work with over the past few months. Thank you so much for the inspiration! Today we send Diana off with warm wishes on the new adventures in her life unfold! 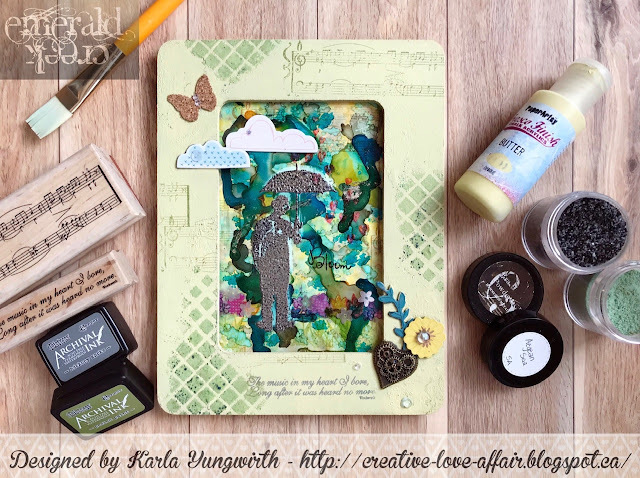 Please pop by her Blog and let her know how much you enjoyed her projects. Aisha please email Kim at admin@emeraldcreek.ca for your prize code. Every month there will be a discount for each of the participants to access. We love having all of you (guys too) participating! WOW!!! Amazing inspiration from the DT for this fantastic new challenge! I so need to join the fun! Thank you so very kindly for selecting my Masculine Graduation card as one of the Top #!!! YaY! Congrats to the Aisha! Her work of art is breathtaking! Hi Samra, thank you for playing on our challenge. We sure do love the projects you create! Congratulations to Aisha on her win and to the top 3!! Always love seeing the creativity that everyone shares for the challenges!! And Design Team...incredible projects as always!! Nothing but so much love for you. Hope that tooth feels better. And most importantly, thank you for being our social media leader. Congratulations to all the winners! Your projects are gorgeous & inspiring! Love that canvas! Thank you Julia! Congrats to Aisha for the win and the other top 3. Your projects were amazing! Once again Design Team, you did a fabulous job! Fabulous makes again this month. Thanks for the inspiration. Awe Karon, we love you so much!!! Biggest congratulations to Aisha, . Kerstin, Samra, and Janell! Awesome DT samples and theme! Alice, what can we say, but you are soooo amazing and inspire us to new levels. Thank you for participating! Oh the love for all things Niki! We are so lucky to have you playing on our challenges. Congrats and many thanks, such beautiful inspirations from all the DT!! The vote was so close. Your mermaid canvas was so mesmerizing! Beautiful inspiration pieces from the Design Team! It is sad to see Julia and Diana leave, but I wish them well! Fun challenge, and I hope to get time to join in this time! Huge congratulations to Aisha, Kerstin, Samra, and Janell! Great projects! Oh Sara, you and your creativity are such a gift. Thank you for sharing it with our team!! Thoroughly enjoyed the tutorial. And the tag canvas is fabulous!!!! Beautiful projects DT! and congrats to all the winners! Thank you. I'm still in love with the Moondance. Definitely was one of my votes! Congrats to all the winners! So well done on your projects!! Ohhh woooow thank you so much for choose my canvas as a winner yupeee!!! Congrats to all winners!!! !